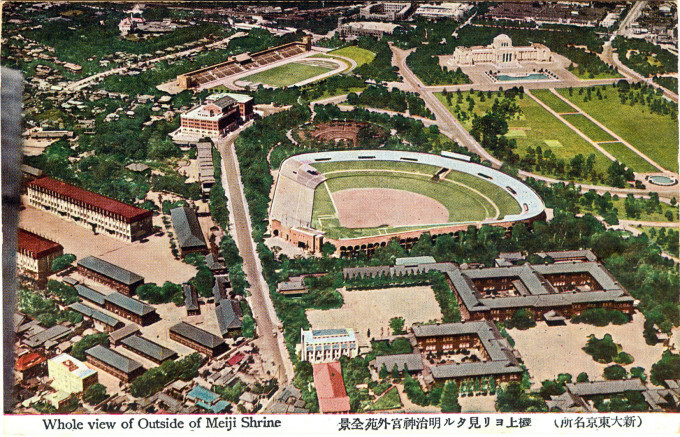 Aerial view of the Meiji Shrine Outer Garden, c. 1925, under construction. 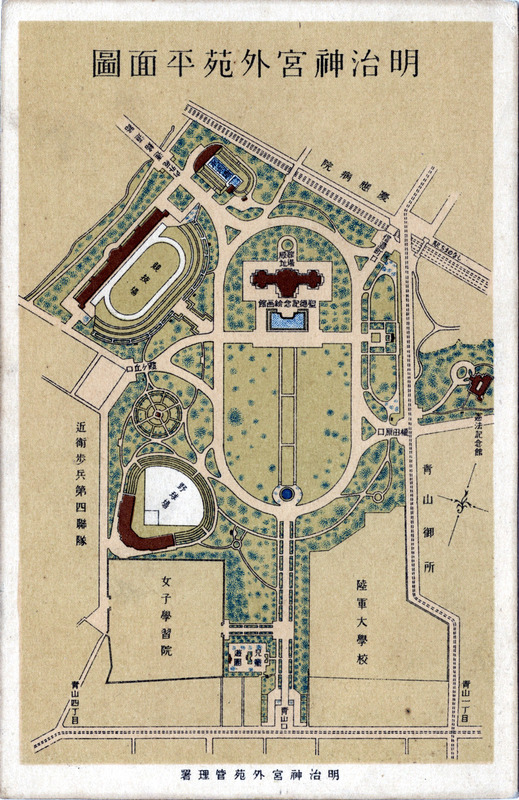 Map: Meiji Shrine Outer Garden, c. 1930. The Meiji Memorial Picture Gallery is at upper-center; the National Stadium and Meiji Jingu swimming pool are at upper left; Gaien Jingu baseball stadium is at lower-left. At right-center is Meiji Constitution Memorial Hall, where the Constitution of the Empire of Japan (1889-1945) was drafted. “Outer Garden of Meiji-jingu Shrine is situated on the site of the former Aoyama Parade Ground and has an area of about 120 acres. It was here that the funeral ceremony of the Emperor Meiji was held in 1912, the site being thus held sacred. “The work of laying out the [Outer Garden] grounds and founding Meiji-jingu Shrine was begun in 1915, and took about ten years to finish, the cost amounting to ¥8.500,000, almost the whole of which was collected by public subscription. 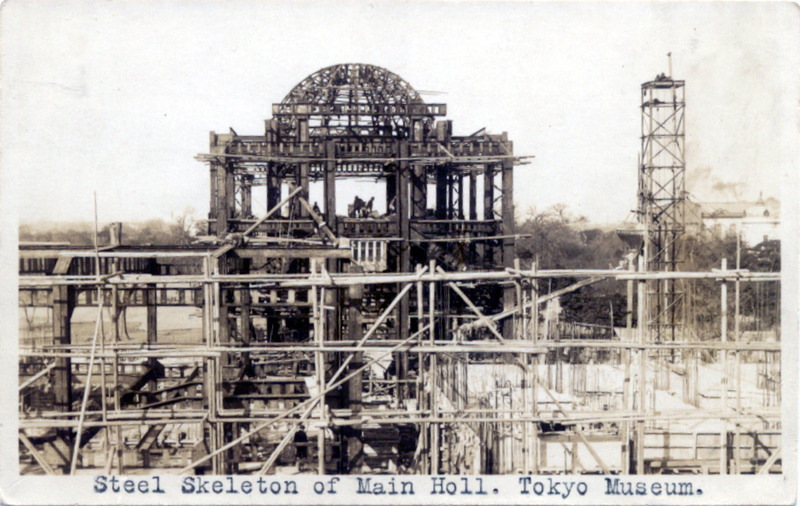 Meiji Picture Gallery under constructon, Meiji Outer Garden, Tokyo, c. 1920. 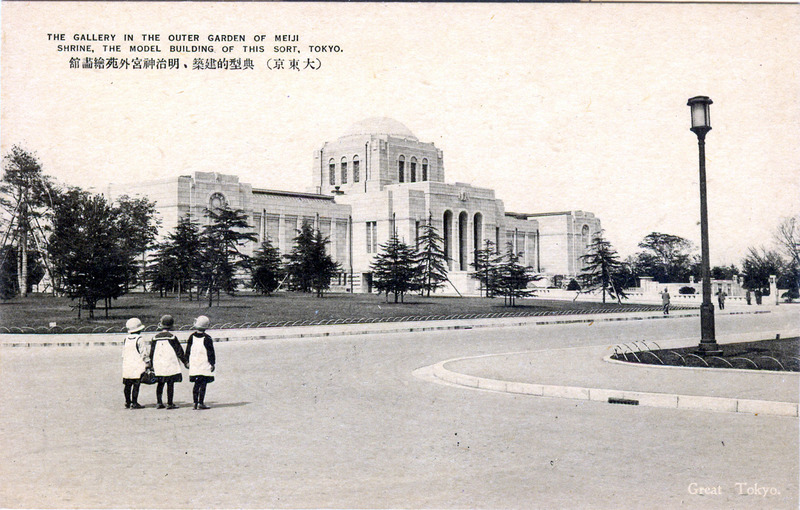 Meiji Memorial Picture Gallery, c. 1930. 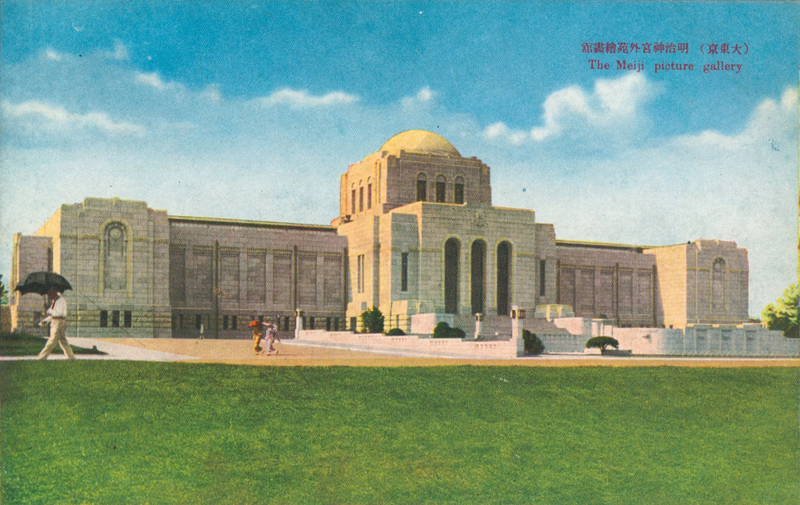 Meiji Memorial Picture Gallery, c. 1940. The Meiji Memorial Picture Gallery was completed in 1925 on the grounds of the Meiji Shrine Outer Garden [Meiji Jingu Gaien], between Aoyama and Sendagaya. 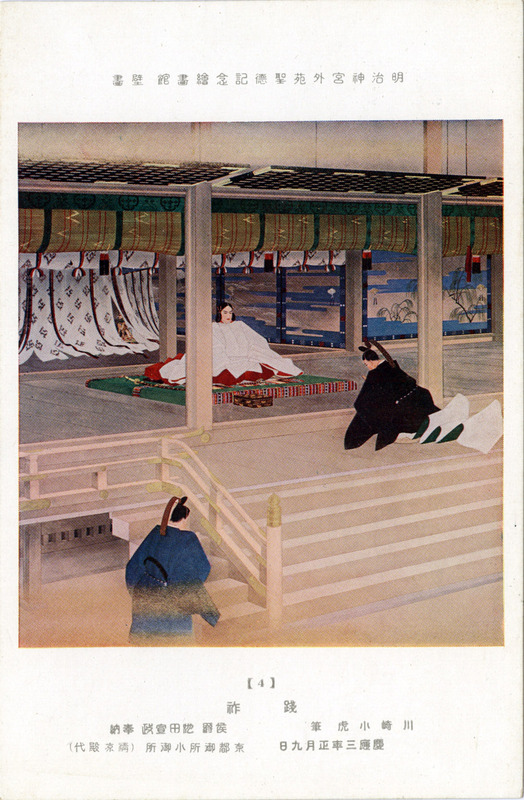 The gallery is a pictorial homage to Emperor Meiji and Empress Shoken to commemorate and display for the public a historical record depicting the the politics, culture, and manners of the Meiji era (1868-1912) when Japan underwent its rapid modernization. The original gallery was destroyed by fire during World War II and was replaced in 1958 by an identical structure. 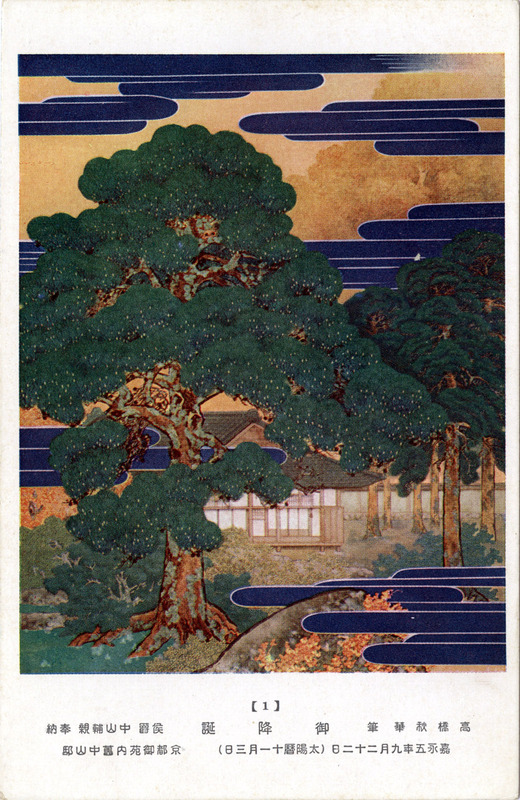 The series of 80 paintings – the first 40 works are painted in a Japanese-style while the latter 40 are Western-style works – move in chronological order beginning with the turbulent era of transition from the Tokugawa Shogunate [bakufu] regime to the restoration of Imperial rule, the adoption of Western-style systems (legislative, judicial, civic, and military) including the promulgation of the Meiji Constitution, Japan’s establishment as a Great Power in the early 20th century and, finally, the death of Emperor Meiji in 1912. 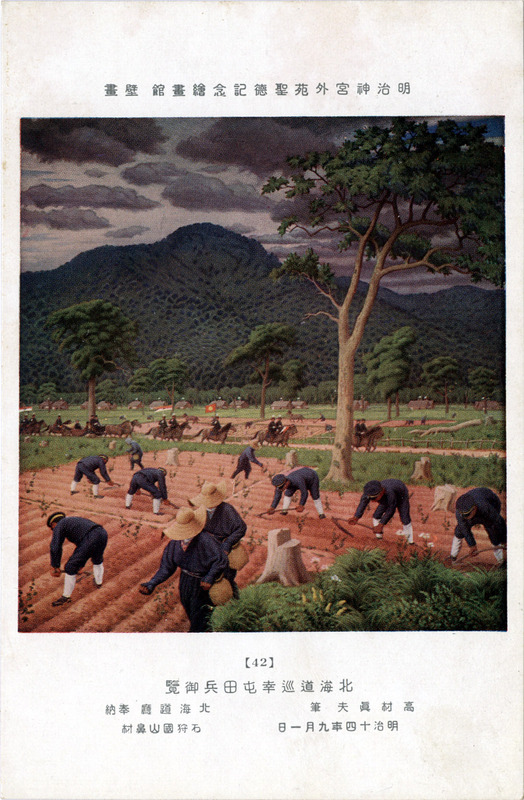 Whole view of Meiji Park Outer Garden, c. 1935. 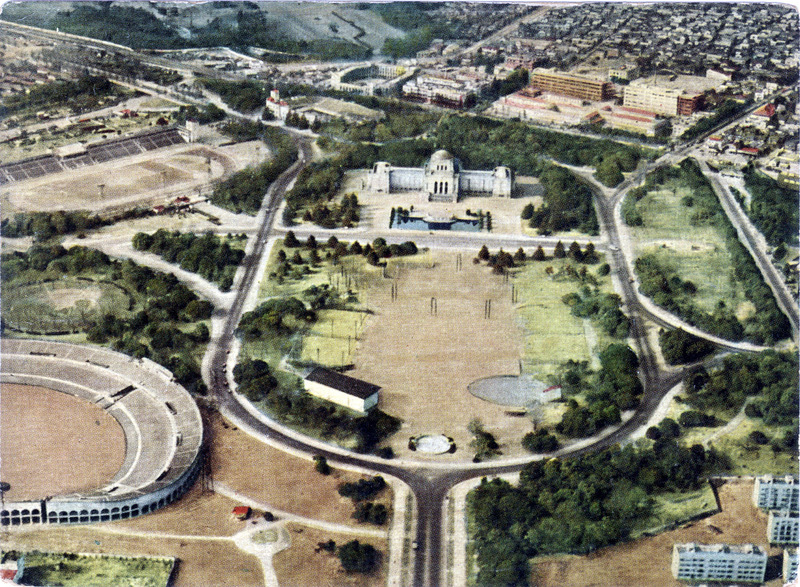 The Meiji Memorial Picture Gallery is at upper-right. Below the Meiji Jingu baseball stadium (at center) is the Peeress’ School, relocated to Yotsuya in 1885 from Kanda. The school would later be merged with Gakushin, relocate to Meijiro and the property in the Outer Garden replaced after WWII by a the national rugby stadium. Meiji Jingu Stadium is one of the few professional stadiums still in existence where Babe Ruth played. In 1934, Ruth joined several other famous baseball players from the U.S., such as Lou Gehrig and Jimmie Foxx, in a 22-game tour of Japan. “The Picture Gallery was designed by the architect Kobayashi Masatsu, and consisted of a narrow hall divided into East and West Wings, divided by a domed central entrance. 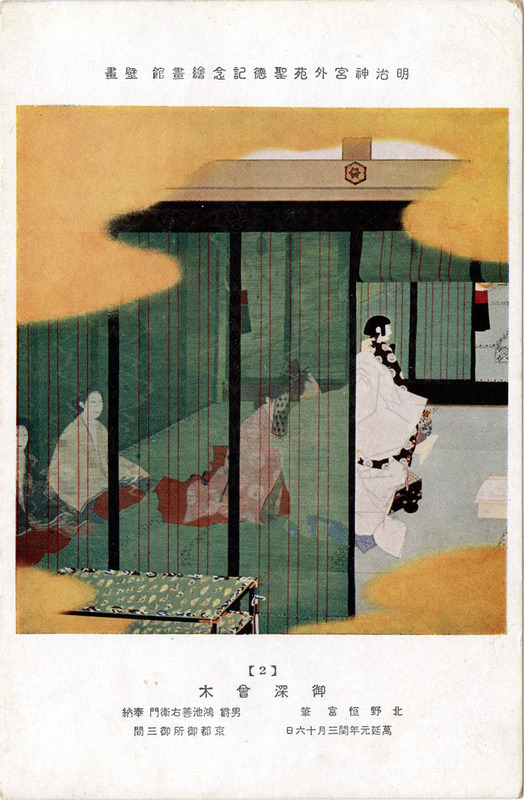 “In the East Wing, 40 Nihon-ga (Japanese-style) paintings, the style of painting that Emperor Meiji preferred,, document key events in his life from his birth in 1852 through to 1878. “Quite appropriately, painting no. 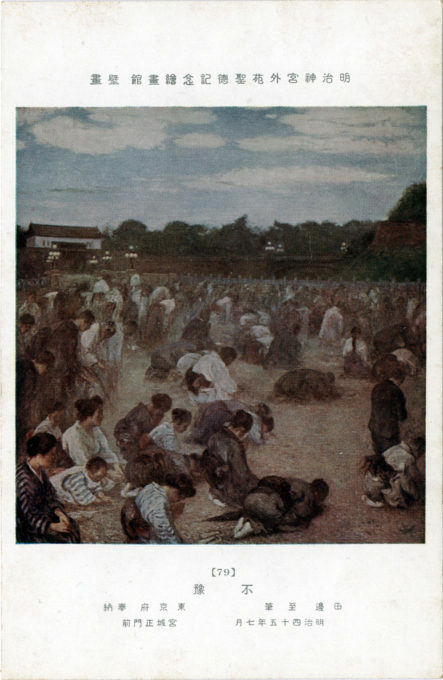 41, the first of the Western-style oil paintings (Yo-ga), shows the Emperor receiving General U.S. Grant, former US President, who visited Tokyo on 3 July 1879. No.1: The Birth of Emperor Meiji (Nov. 3, 1852). No. 2: The Rites of Growth (ceremonial trimming of hair). No. 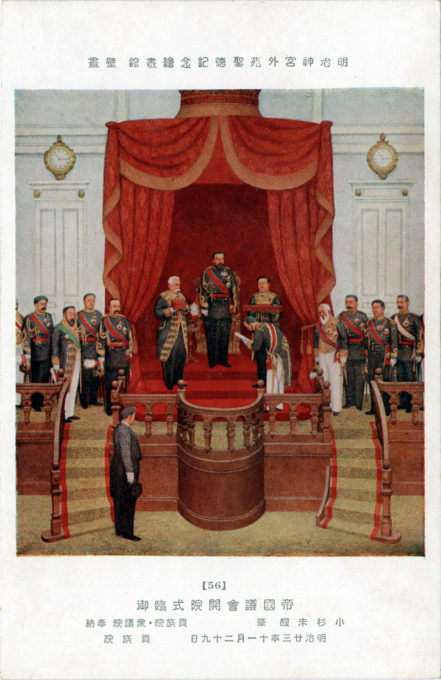 4: Accession to the Throne (Feb. 13, 1867). No. 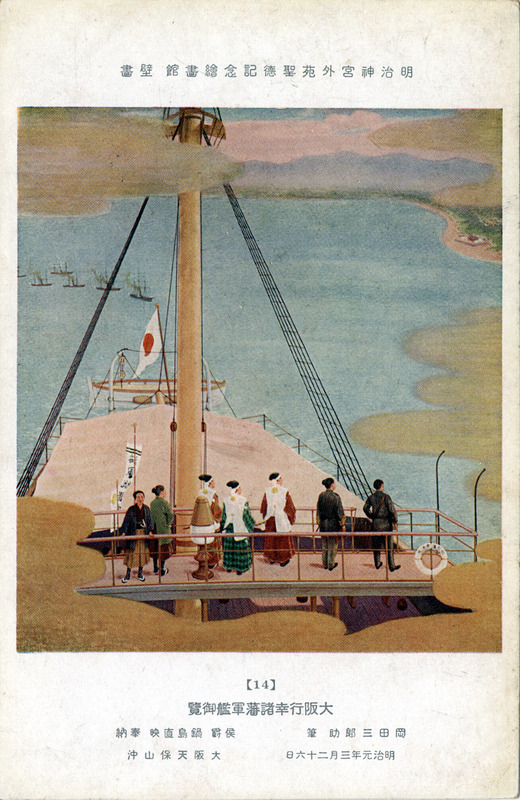 14: Visiting Osaka, 1872. Tour of Japan on board Emperor Meiji’s flagship, the ironclad Ryujo. No. 42: The Emperor inspecting the farmer-soldiers tondenhei) during the imperial tour of Hokkaido (September 1, 1881). No. 56: Opening of the Imperial Diet ( November 29, 1890), marking the beginning of rule under the Meiji Constitution. No. 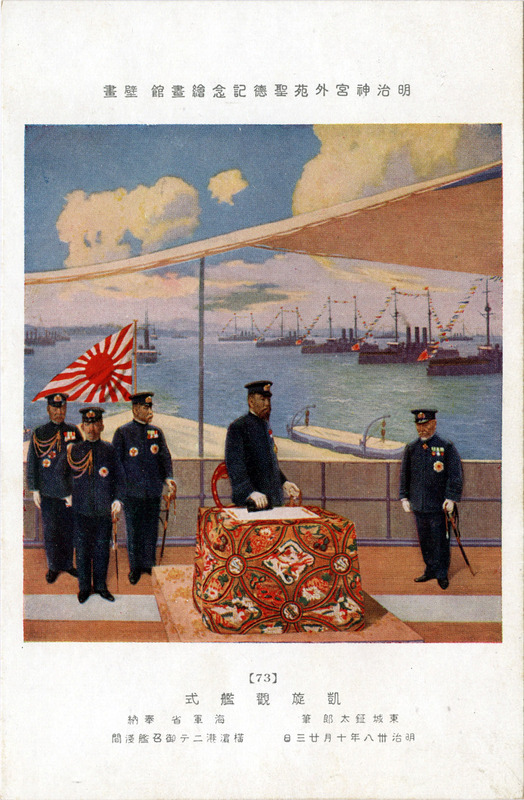 73: The Triumphal Grand Naval Review (Oct. 23 1905), following Japan’s victory over Russia. No. 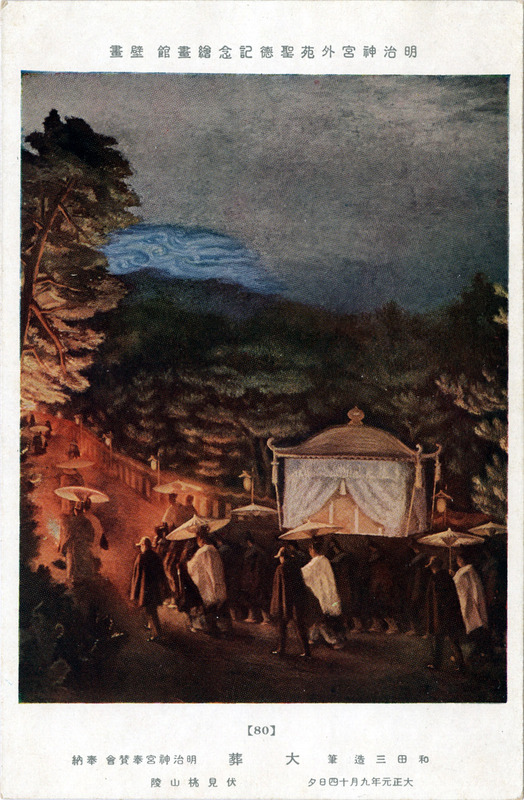 80: The Imperial Funeral (Sept. 14, 1912). After a ceremony at the Aoyama Funeral Pavilion in Tokyo on 13 September, the Emperor’s coffin was taken by train to Kyoto, before being conveyed to Fushimi Momoyama no Misasagi.